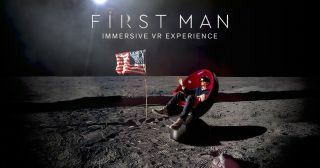 The "First Man" virtual-reality experience puts you in Neil Armstrong's place during the moon landing. If you ever wanted to follow in Neil Armstrong's footsteps to the moon, you can do so this month — in virtual reality. "First Man: The Virtual Reality Experience" opened in select AMC theaters in the United States last week to celebrate Armstrong and the new Hollywood biopic about his achievements, "First Man." The virtual reality experience will play at AMC Lincoln Square in New York City from Oct. 6 to Oct. 14, and at three other theaters from Oct. 5 to Oct. 14: Universal Cinema AMC at CityWalk Hollywood in California, AMC Metreon 16 in San Francisco, and AMC Georgetown 14 in Washington, D.C. The virtual-reality experience also includes Armstrong's famous decision to take over the lunar module's automatic landing sequence in the minutes before landing because the spacecraft — The Eagle — was steering the crew toward a boulder-filled field. "You experience, firsthand, Armstrong's grit, determination and nerves of steel as you land safely on the lunar surface," according to a statement from Universal Pictures. "We're thrilled to have brought together real pioneers in the VR space to collaborate on this experience," Austin Barker, Universal's executive vice president of creative content, said in the same statement. "This was both a fantastic and obvious opportunity for us. This is as close as most of us will ever get to being an astronaut, if only for a few minutes." Armstrong is most famous for being the first human to walk on the moon, on July 20, 1969, during the Apollo 11 moon landing. Buzz Aldrin accompanied him on the surface; Michael Collins also flew to the moon, but remained in orbit aboard Columbia. Armstrong's test flight experience included piloting the high-altitude X-15 fighter jet project. He was selected as a NASA astronaut in 1962. His other spaceflight was on Gemini 8 in 1966, when Armstrong and Dave Scott brought their spacecraft down safely after it spun out of control during a docking. Armstrong resigned from NASA in 1971; he died in 2012 of complications of heart surgery. "First Man," starring Ryan Gosling, is based on the 2005 James Hansen authorized biography of l Armstrong with the same title. The movie officially opens in theaters across the country on Friday (Oct. 12). Follow us @Spacedotcom and Facebook. Original article on Space.com.